This morning began with another checkout after a one-night stay in Dongtan. 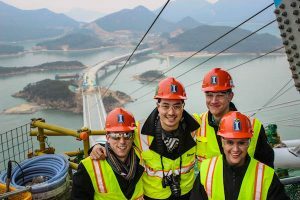 The GLCM packed up and began our travel to the west coast of South Korea to Gunsan-si where we were excited to be visiting the Dandeung Bridge that is currently under construction, as shown in the picture above. However, we had two hours until we reached our destination. Luckily enough, we had a plethora of playing cards, and Euchre quickly became the name of the game. This drastically helped the ride go fast especially since we had three games going on at once. Once the bus came to a halt, we were all a little confused. We stopped in a large parking lot with no sign of a bridge around at all. Here, we gathered our hard hats and safety vests, split up into vans and SUVS, and were driven down a very rocky and bumpy dirt path until we finally saw where the bridge was under construction. What a site to see. 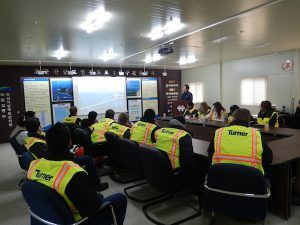 We began by filing into an on-site conference room where we were introduced to Hyunsok Choi, one of the engineers on the project as shown above. Mr. Choi works for Daelim, which is one of the construction companies working on the Gogunsan-Islands Road Connection Project. The Dandeung Bridge project aims to secure convenience for residents and to promote tourism. 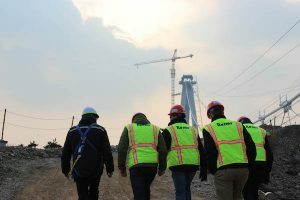 There are three sections to this project, where Daelim is in charge of the design and construction of sections I and II, the highway to get to the bridge, and the main structure of the bridge. The Dandeung Bridge is a suspension bridge with one tower. This will be the sixth single-tower suspension bridge in the world. One span is 400m (0.25 mi) in length, which will be the longest span among single tower suspension bridges. 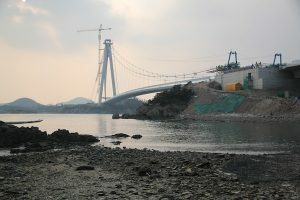 The design for this bridge was completed in November 2009 and the Dandeung Bridge is planned to open for traffic this coming December 2015. The design of the bridge consists of two traffic lanes and a pedestrian lane on either side. The tower is of an A-shape and a D-shape. We were curious as to why the bridge had this curved shape and if it helped with the overall structure. To our surprise, is has no structural role and was chosen by the Korean government because of its aesthetics. Walking along the bridge, we were able to see how the blocks of the bridge structure were put together. It was split into 26 blocks that were placed using a new type of lifting gantry that Mr. Choi patented last June. We quickly approached the large tower where we were lucky enough to be lifted up to the top and were able to look out over the site. 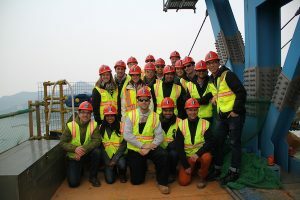 Here, we took advantage of the photo opportunity and were able to further observe the bridge. We could follow the long cables down from the top. 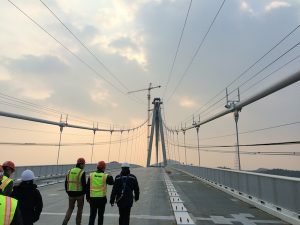 In the conference room, Mr. Choi described to us the wire that was stranded together to make these cables; over 1080 tons of wire were used in this bridge. Because we were able to walk on site and go to the top of the tower, we all could not help but to take lots of pictures. The scenery was beautiful with all of the surrounding water and islands, and we were all in awe of the massive structure that we were walking on and were able to look out from.